I don’t actually have a tipsy Italian uncle that I’ve named this after, and because of that, I wake up sorrowful every day. Okay, that’s not true! I did receive a bottle of Uncle Nearest 1856 whiskey in the mail recently though. That’s true! I know, getting whiskey in the mail should make me happy – and it does. True! 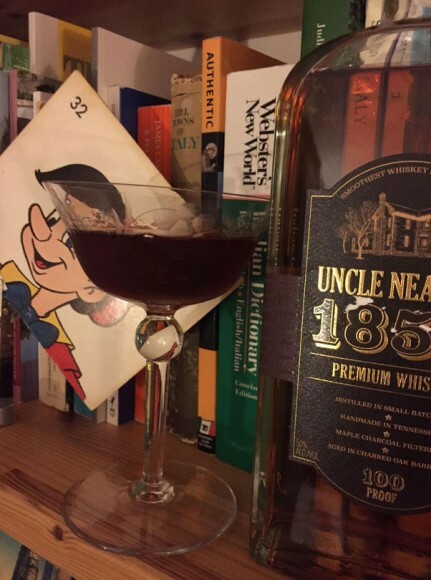 Uncle Nearest has a great story. It was made in honor of Nathan “Nearest” Green, a former slave who as the story goes taught Jack Daniel how to distill. Amazing! While it was launched in Portland, OR, it’s made in Tennessee using at least 51% corn, filtered via sugar maple charcoal, aged in new American oak, and bottled at 100 proof. That proof gives it a nice sturdy backbone, mellowed by vanilla and rounded out with hints of sesame and cinnamon in the flavor. It’s a sipper, for sure, and one that’ll warm you and your uncles. When mixing with it, I wanted to keep that umph and personality, but take a little edge off, and bring some herbal helpers into the party. And I went Italian (as I often do), with Montenegro amaro (which lies on the sweeter side of the amaro scale) and Punt e’ Mes vermouth. Also brought old pal Peychaud along, too. End result is robust, with layers and layers of flavor. I think tipsy uncles everywhere would be proud. 1. Fill a cocktail shaker halfway full with cracked ice. Add the whole family. Stir well. 2. Strain into a cocktail glass. Make a second for your uncle (or in his honor, at least). It’s October, which means we have one eye on the upcoming glistening holiday season, and one still on the summer that’s passed, and one on Halloween of course (I’m taking it for granted that each of us has three eyes – it is near Halloween). 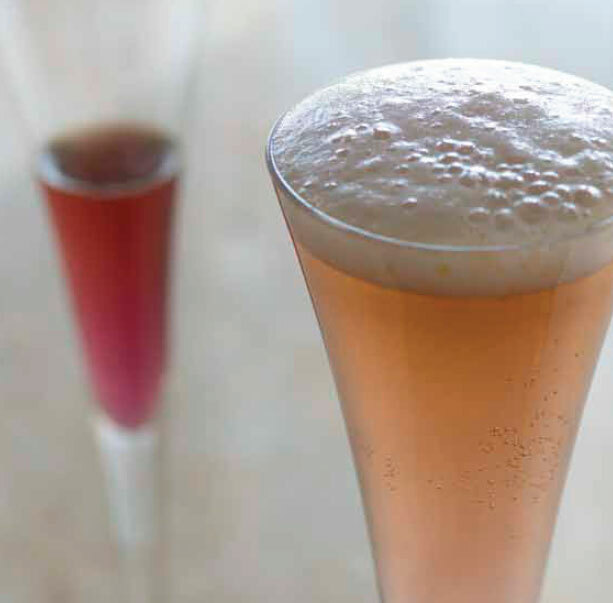 This position in the party calendar year makes this the ideal time for sweet sparkling wines. Well, really, I’m okay with them anytime, but as they are both ideal for summer (when served nice and cold) and winter (when they match those holidays parties you’re waiting for), then of course, they’re doubly ideal now. That’s my logic. Lucky for me then, a bottle of Castello del Poggio sparkling moscato showed up in the mail recently. Don’t hate me for my luck! 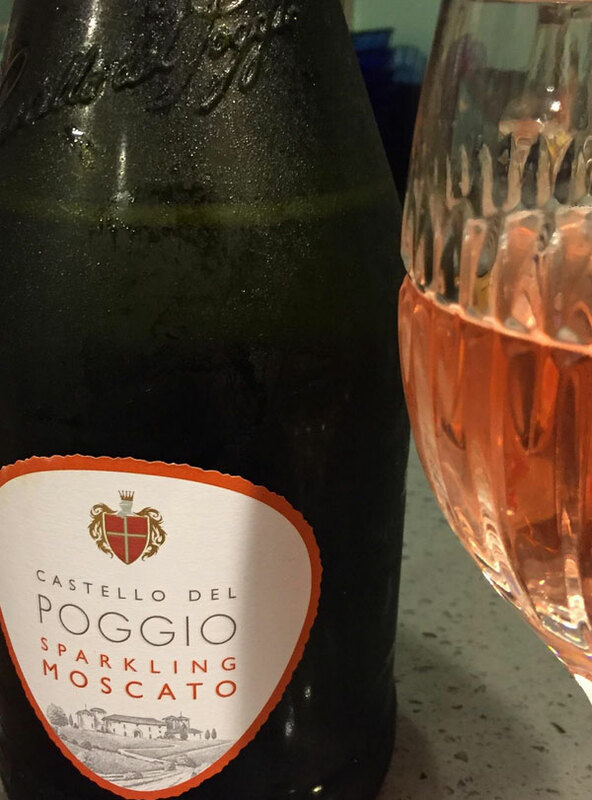 A delicate, lovely, fruity wine, this moscato is a delight. Castello del Poggio is located in Piedmont (in Italy, if that wasn’t obvious), and makes for a pretty sipper from the peachy aroma to the sweet fruity kiss of a flavor, with lots of notes to dwell on. Pear? Sure. Peach? Maybe a bit of strawberry? I thought so, but your palate may differ. There’s a consistent effervescence, too. All combined, makes for a memorable aperitif, or a dessert accompaniment. It also makes swell sparkling cocktails (you probably knew I was going to go there, cause you’re smart)! When using it in this drink – called How Silver-Sweet, from R&J, because the sweetness – I wanted to balance it while aligning on the fruit. So, I started with a favorite local spirit, Sidetrack Distillery’s Strawberry brandy. A really, classic, fruit brandy, it’s dry, strong, and carrying the pure essence of the fruit – fruit harvested from the farm where Sidetrack is located. To umph the fruit even more, and rounding out the basket, I also added Pierre Ferrand’s orange curaçao. And then, a final touch, some herbal undertones provided by Peychaud’s bitters. 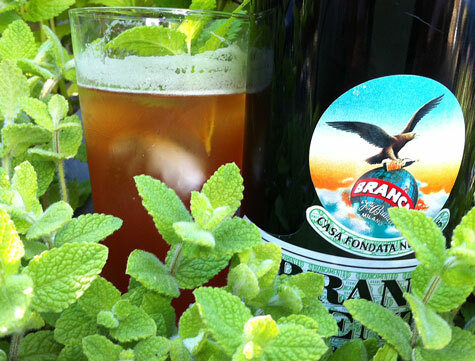 The end result is a layered drink that boasts sweetness and light and lots of flavor. 1. Fill a cocktail shaker or mixing glass halfway full with cracked ice. Add the brandy, curaçao, and bitters. Stir well. 2. Strain into a wine glass (or flute). Top with the moscato. Stir briefly. Sip sweetly. This favorite of mine recently popped up in conversation with a pal-of-mine (about orange things, funny enough), and it reminded me just how much I like it. Like it? I love it! 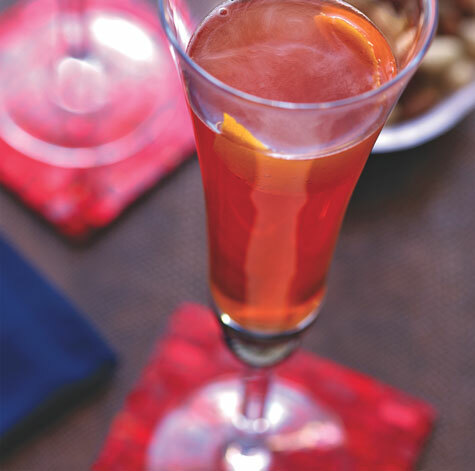 It’s a wonderfully-balanced mix – if I can say so without sounding too full-of-myself, since I created it – with some ingredients that you don’t naturally think would go together in dark rum and Campari. But thanks to the edge-smoothing triple sec (I’d say go with homemade, if you can – there’s a recipe in Luscious Liqueurs) and the peacemaker, Perychaud’s bitters, everything plays nice. It’s always tasty fun to re-discover an old liquid friend. And this is one of my besties. 1. Fill a cocktail shaker halfway full with ice cubes. Add the rum, Campari, triple sec, and bitters. Shake well. 3. 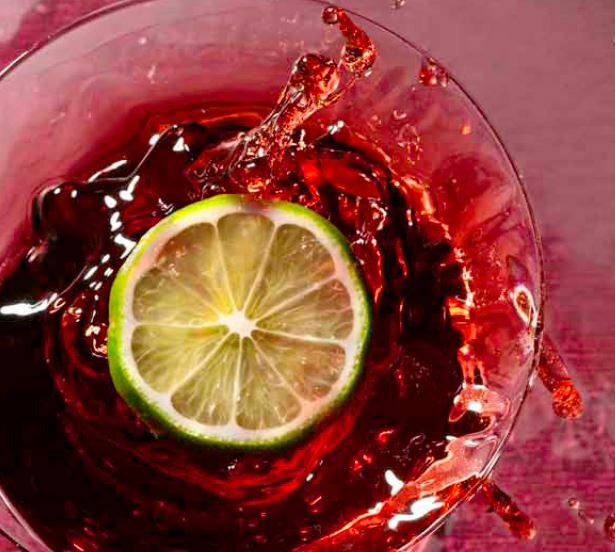 Squeeze the lime slice over the glass and drop it in without any mystery.